Kishio Suga (b. 1944, Iwanate Prefecture, JPN) currently lives and works in Shizuoka, Japan. He studied oil painting under Yoshishige Saito at Tama Art University and graduated in 1968. 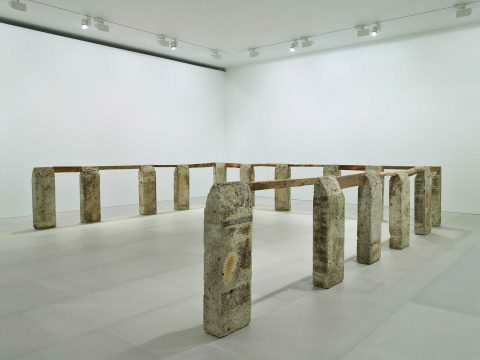 Rising to prominence in the mid-1960s, Suga and other Mono-ha artists, such as Lee Ufan and Nubuo Sekine, eschewed traditional representation, instead exploring quotidian and natural materials; investigating the relationship between them and their impact on the surrounding the space. The movement grew both in response to the rapid industrialisation of Japan and also as a reaction to the dominant influences of western art history. Situations is the first European retrospective dedicated to Kishio Suga. 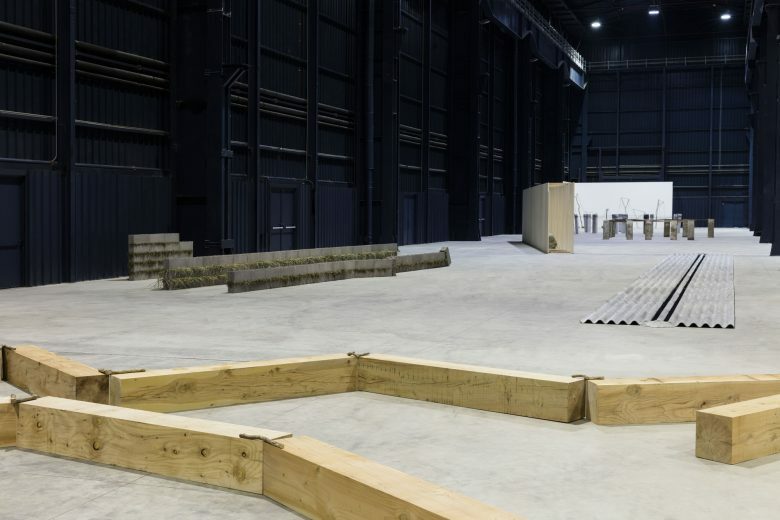 For the first time in the career of this pivotal figure in contemporary Japanese art, over twenty of his installations, dating from 1969 to the present, are shown together in the Navate space. Kishio Suga showed at the 8th Biennale de Paris in 1973 and the 38th Venice Biennale in 1978. Suga’s recent solo exhibitions include: Situations, Pirelli HangarBicocca, Milan, IT (2016); Situated Latency, Museum of Contemporary Art Tokyo, Tokyo, JP (2015); Blum & Poe, New York, US (2015); Vangi Sculpture Garden Museum, Shizuoka, JP (2014); Kishio Suga 1970/80, Gallery Cocon, Tokyo, JP (2014); Placement of the Hidden Currents, Tomio Koyama Gallery, Tokyo, JP (2012). 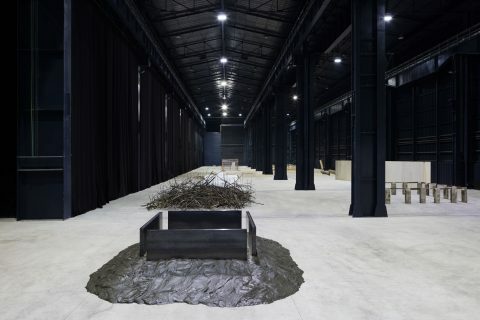 Selected Group exhibitions include; Utopias and Heterotopias: The Wuzhen International Contemporary Art Invitational Exhibition, Wuzhen, CN (2015); MONO-HA, Fondazione Mudima, Milano, IT (2015); Construction / Destruction, Almine Rech Gallery, Paris, FR (2015); Abstract Drawing (Curated by Richard Deacon), Drawing Room, London, UK (2014); Other Primary Structures, The Jewish Museum, New York, US (2014); 2013-1 Layers of Artistic Expression, Hiroshima City Museum of Contemporary Art, Hiroshima, JP (2013); Prima Materia, Punta della Dogana, Venice, JP (2013); Tokyo 1955-1970: A new Avant-Garde, Museum of Modern Art, New York, US (2012); Double Vision: Contemporary Art from Japan, Moscow museum of modern art, Moscow, RU (2012); MOT Collection Enter here _ what do you see?, MOT : Museum of Contemporary Art Tokyo, Tokyo, JP (2010); Japon des Avant Gardes 1910-1970, Centre Georges Pompidou, Paris, FR (1986); Japanese Art after 1945: Scream against the Sky, Yokohama Museum of Art, Japan; Guggenheim Museum Soho, New York and San Francisco Museum of Modern Art (1994-95). I. Chang, “Requiem for the Sun.” Frieze, no. 148, June–August. “One-Line Reviews: Our Staff”s Pithy Takes on the Mono-ha Retrospective, Summer”s First Group Shows, and More.” Artinfo.com, June 29Hiro, Rika. “Public Art-Making in an Inn”s Garden: Artist Suga, New Work, Too, Is on Display.” Shimotsuke Shimbun, September 2, 2009. M. Matsui, “Kishio Suga.” Artforum 46, no. 9 (May 2008): 400.